The Mosaic law prohibits shaving the corners of the head and of the beard (Lev. xix. 27), the priests being particularly enjoined not to desecrate their persons by violating the latter prohibition (ib. xxi. 5). The prophet says: "Neither shall they [the priests] shave their heads, nor suffer their locks to grow long; they shall only poll their heads" (Ezek. xliv. 20). The phrase "kasom yiksemu" (poll) is explained in the Talmud as meaning "clipped and artistically cut in the Lylian style, . . . the ends of the hair of one row reaching the roots of the next row." The high priest had his hair treated thus every Friday; the ordinary priest, once in thirty days; and the king, every day (ib. ; Ta'an. 17a). This mode of hair-cutting among the nobility probably distinguished them from the common people, whose heads were shaved entirely except the ends or ear-locks ("pe'ot") and the ends of their beards; it was very expensive, and Ben Eleasah is said to have squandered a fortune by his endeavor to imitate it (Sanh. 22b). This Mosaic prohibition, like many others, was intended to counteract the influence on the Israelites of the heathen rites, "the ways of the Amorite." Maimonides says: "The prohibition against rounding the corners of the head and marring the corners of the beard, such being the custom of idolatrous priests . . ." ("Moreh," iii. 37). 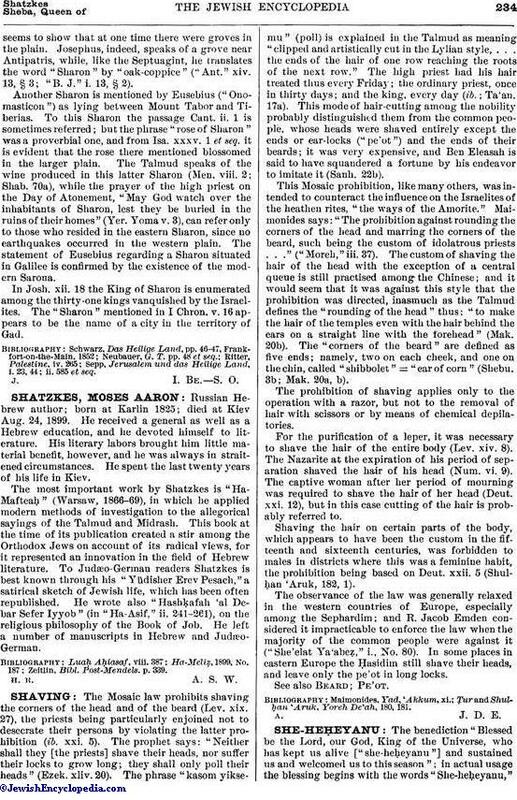 The custom of shaving the hair of the head with the exception of a central queue is still practised among the Chinese; and it would seem that it was against this style that the prohibition was directed, inasmuch as the Talmud defines the "rounding of the head" thus: "to make the hair of the temples even with the hair behind the ears on a straight line with the forehead" (Mak. 20b). The "corners of the beard" are defined as five ends; namely, two on each cheek, and one on the chin, called "shibbolet" = "ear of corn" (Shebu. 3b; Mak. 20a, b). The prohibition of shaving applies only to the operation with a razor, but not to the removal of hair with scissors or by means of chemical depilatories. For the purification of a leper, it was necessary to shave the hair of the entire body (Lev. xiv. 8). The Nazarite at the expiration of his period of separation shaved the hair of his head (Num. vi. 9). The captive woman after her period of mourning was required to shave the hair of her head (Deut. xxi. 12), but in this case cutting of the hair is probably referred to. Shaving the hair on certain parts of the body, which appears to have been the custom in the fifteenth and sixteenth centuries, was forbidden to males in districts where this was a feminine habit, the prohibition being based on Deut. xxii. 5 (Shulḥan 'Aruk, 182, 1). The observance of the law was generally relaxed in the western countries of Europe, especially among the Sephardim; and R. Jacob Emden considered it impracticable to enforce the law when the majority of the common people were against it ("She'elat Ya'abeẓ," i., No. 80). In some places in eastern Europe the Ḥasidim still shave their heads, and leave only the pe'ot in long locks. Ṭur and Shulḥan 'Aruk, Yoreh De'ah, 180, 181.